Category Archives: West Coast Productions Inc.
District of Columbia (DC), Dunlap Grubb & Weaver PLLC, Forum Shopping, Judge Alan Kay (DC), Judge Wilkins (DC), Millennium TGA Inc., Nu Image Inc., Texas (TX), Torrent, Uncategorized, West Coast Productions Inc.
“Forum Shopping” is the link between the TX & DC “Millennium TGA, Inc.” lawsuits. As a response to the “You Have Been Shopped” article written by DieTrollDie on forum shopping, I do have some insight to add to this. In short, there are not two Millennium TGA lawsuits in this forum shopping scandal, but three (if you are counting the “motion to compel” lawsuit in DC which is the key to understanding exactly what is going on — this is the missing link which provides the insight I am sharing). 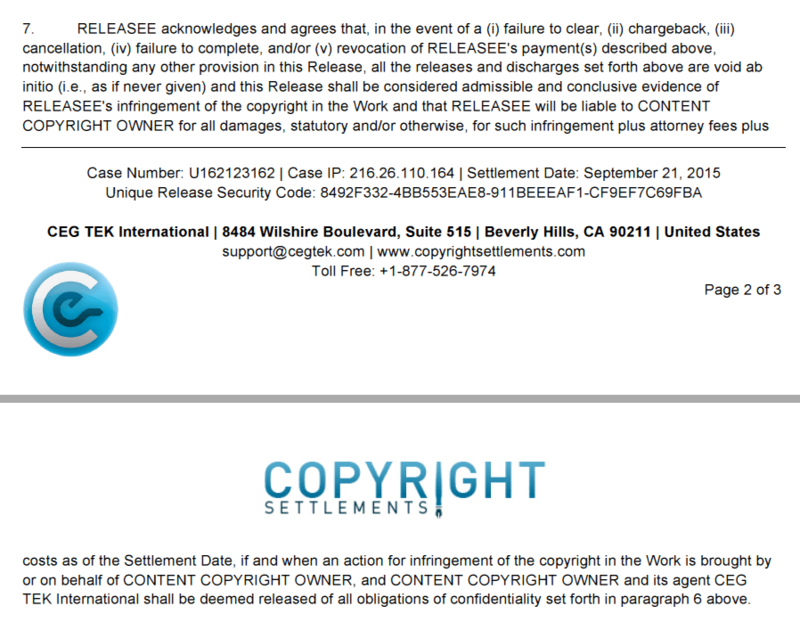 MILLENNIUM TGA I: In short, on 12/7/2012, Millennium TGA v. Does 1-939 (Case No. 1:11-cv-02176) (hereinafter, “Millennium TGA I”) was filed in DC. It was assigned to Judge Robert Wilkins, the DC judge who killed the “Expendables” bittorrent lawsuit — this was the Nu Image, Inc. v. Does 1-23,799 lawsuit by Dunlap Grubb & Weaver, PLLC which quickly expanded from 6,500 into 23,222 John Doe Defendants before the judge shut down the case. It took Prenda Law Inc. a week to figure out that their judge was THE Judge Wilkins, and they quickly and voluntarily dismissed the case. MILLENNIUM TGA II: Four days later, Prenda Law Inc. used their local counsel Doug McIntyre (the same local counsel who was almost fired because he took on the West Coast Productions, Inc. client [remember them in DC and in W.VA with their attorney Kenneth Ford who is now in jail?] in his West Coast Productions, Inc. v. Does 1-351 (Case No. 4:12-cv-00504) case which he filed without telling Prenda Law Inc. about it) and on 12/20/2012, Doug McIntyre filed the Millennium TGA, Inc. v. John Doe (Case No. 4:11-cv-04501) case here in the U.S. District Court for the Southern District of Texas. This case involves pretty much identical parties, facts and claims as were alleged in the MILLENNIUM TGA I case in DC. I suppose they thought nobody would notice their overt forum shopping, especially since they changed the name of their lawsuit. This is where the story gets interesting. On 2/29/2012, Comcast objected to the subpoena by stating that 1) the court lacked personal jurisdiction over most of the IP addresses listed in the subpoena; 2) there were serious joinder issues in the lawsuit; and 3) the plaintiff was engaging in “a blatant attempt to FORUM SHOP” since they already dismissed MILLENNIUM TGA I to avoid being in front of Judge Wilkins in DC. MILLENNIUM TGA III: As a result, Prenda Law Inc. (Millennium TGA, Inc.’s attorneys) filed a lawsuit against Comcast (it was actually a “motion to compel”) in the MILLENNIUM TGA, INC. v. JOHN DOE (Case no. 1:12-mc-00150) case in DC. It was in this lawsuit that John Steele “surfaced” from pretending (think, “Prenda”) that he was not associated with Prenda Law Inc. since Paul Duffy allegedly took over the firm. It is also my understanding that Prenda Law Inc. didn’t realize that John Seiver was the attorney behind the scenes on this case, and what they might not have known was that John Seiver has wreaked havoc on bittorrent cases as long as two years ago with the Digiprotect cases in New York. Perhaps even Prenda Law Inc.’s predecessor firm Steele|Hansmeier, PLLC was not yet in existence when this happened, and John Steele was still running his divorce practice a la the Steele Law Firm, PLLC. Either way, I suspect that they filed the motion to compel Comcast to comply with the subpoena in order to bully them, and they didn’t realize that Comcast (through John Seiver) would fight back. Now advancing forward a bit on the timeline, Magistrate Judge Alan Kay ignored pretty much every point that Comcast brought up and he issued an order on 4/18/2012 ordering Comcast to comply with the subpoena for the MILLENNIUM TGA II Texas case. They were ordered to reveal 351 of the subscriber identities to Prenda Law Inc. This is, however, where it gets interesting. John Seiver, obviously realizing that Magistrate Judge Kay made a dumb ruling, essentially called him a moron in appealing his order. As an attorney, I would hold my tongue myself here in writing this article, especially because I am interested in seeing John Seiver and Comcast prevail, and I know that sometimes a judge can rule his court by ego rather than adhering to the law, but Magistrate Judge Kay’s ruling against Comcast was so dumb I could not contain myself. In short, according to Comcast’s appeal, 1) the judge erred by failing to consider any of the legitimate defenses that Comcast raised on behalf of its subscribers. 2) The judge erred by failing to address the fundamental issue of whether any of the unnamed Does would be subject to personal jurisdiction (either in Texas, or in DC per the motion to compel). 3) The judge erred by failing to address the possible misjoinder of the one John Doe defendant (and the many co-conspirators) in the Texas case. 4) The judge erred by failing to realize that “conspiracy” is not a sufficient crime to allow massive discovery on the John Doe Defendants, and 5) Magistrate Judge Kay was not the proper judge to accept this case — according to DC’s own local rules (Local Rule 40.5), the case should have been immediately reassigned to Judge Robert Wilkins, the judge who was previously assigned to the MILLENNIUM TGA I case, since MILLENNIUM TGA I and MILLENNIUM TGA II had identical claims. As of this evening, I am still waiting to hear a ruling on this appeal. Now for those of you still in Prenda Law Inc.’s MILLENNIUM TGA II (Millennium TGA, Inc. v. John Doe (Case No. 4:11-cv-04501)) case here in the U.S. District Court for the Southern District of Texas, if you are a Comcast subscriber, as you can see, there are unresolved questions in the MILLENNIUM TGA III DC case, and your status is uncertain. Thus, my contribution to the FORUM SHOPPING article by DieTrollDie today is that the DC MILLENNIUM TGA III case holds the key to understanding what is currently going on in the MILLENNIUM TGA II case here in Texas. Now as for everyone else (e.g., non-Comcast clients who are in the MILLENNIUM TGA II Texas case), understand now that the MILLENNIUM TGA III [motion to compel] DC case directly impacts your Texas case. Obviously this is something we are watching for our clients. If you are interested in reading this entertaining appeal by Comcast in order to understand the entire story and its implications, I have attached a copy of Comcast’s motion below.